With Hog Roast Hazlemere your corporate lunch doesn’t have to be dull and uninspiring. We can offer you three course meals or bite sized lunches to impress your clients or staff with all at an affordable price. Our flexible style of cooking allows us to cater for any number of guests and can provide for any dietary requirements due to our profession team and knowledge of the culinary business. This week we were at Hazlemere’s retail centre providing a corporate lunch for visitors and staff members of the centre to celebrate the recent launch of a new electrical store. The organisers had been let down by a previous company who said they could not cater for the launch as there was no definitive number of guests. 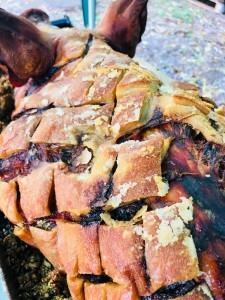 However, for Hog Roast Hazlemere this was a walk in the park as our fully flexible traditional cooking style allows us to easily cater for all numbers of guests depending on the size of the hog we roast. We were told to expect anywhere in the range of one hundred to one thousand customers so got to work preparing our first hog roast of the day that could easily feed two hundred people. Then as the day progressed we could add more food to our machines depending on demand. This suited the organisers well and as they sampled our first roast they were put at ease as they could tell our Hog Roast Hazlemere team knew what we were doing! With lots of freshly baked floured rolls we served the guests who were visiting the new store. In no time word had spread of the Hog Roast Hazlemere and we started to get a queue forming of people eager to get a taste. We could tell it was going to continue like this throughout the day so quickly prepared more food so there was plenty to go around! The day ended with lots of enquiries into our business and a flurry of people interest in the new electrical store – an all-round success for Hog Roast Hazlemere! Hog roasters delivering fine food in Finstock and service rain or shine!